They were going to just put her "to sleep"! Upper respiratory infection (URI) is a real problem for cats in shelters – not only are cats with URI frequently quarantined, delaying adoption – they must experience both social isolation and medical treatment, just adding to an already stressed cat’s stress. Sadly, URI is also a common reason for euthanasia, as many shelters don’t have the resources to care for these cats. I’ll use my own cat as an example, many years ago, she was 10-months old, adorable, and on the euthanasia list at a local shelter for clear, nasal discharge (AKA URI). Luckily, my dear friend (and shelter co-worker at the time) pulled her from that shelter so she could be placed up for adoption at the shelter we worked at. We scooped her up; she never needed treatment for the URI symptoms, and 14 years later, she’s happy and healthy and an important part of my family! A recent study from UC Davis looked at conditions across nine animal shelters to try to narrow down risk factors for feline URI. “Cage size, movement in and out of housing during daily care, and other environmental and population health risk factors for feline upper respiratory disease in nine North American animal shelters (well isn't that a mouthful)” was recently published in PLoSONE (open access! ), and shares some insights about the frequency of URI in shelter cats, and what may increase or reduce transmission. Shelters were asked several questions about housing, management and other environmental factors. The questions of interest to the study were: amount of space provided for cats in their cage or housing, whether a hiding box was provided, how frequently cats were moved during the first week of their shelter stay, whether young and adult cats were housed in the same rooms, and whether cats were given an intranasal vaccine at intake. Then shelters were asked to track cats presenting with URI symptoms every day. Cats who arrived at the shelter with symptoms, or who “broke” with URI symptoms within the first two days of their stay were not included, and were considered “pre-existing,” rather than shelter-acquired cases. To determine whether particular viruses were responsible for URI symptoms in different shelters, over 300 healthy cats across the nine shelters had their eyes and mouths sampled for genetic analyses designed to look for calicivirus, herpesvirus, and three other common viruses. Seventeen percent of cats who entered the shelter contracted URI during their stay. The results suggested cats who had more than 8 square feet of living space and who were moved only one or two times during their first week at the shelter were less likely to come down with URI. Mycoplasma felis and feline herpesvirus were the most prevalent viruses in shelters. Interestingly, there were higher rates of URI in shelters that provided cats with a hiding space. Intranasal vaccines were also associated with more URI, for unclear reasons - although one possibility is that intranasal vaccines elicit some clinical signs that appear URI-like. There was no effect of whether adult and juveniles cats were housed together. It should be noted that most shelters (8/9) kept cats in spaces that were SMALLER than 8 square feet. Three shelters always provided cats with a hiding space, three did sometimes, and three did not. In the shelters that provided a hiding space, almost all (5/6) had small cages. Six out of nine shelters moved cats more than twice in their first week in the shelter. So an important question is whether it was the hiding space per se that was related to the higher URI count, or if it is the association between a smaller cage and the hiding spaces that led to that result. Given that a hiding box is considered an important way to reduce stress in shelter cats, perhaps a larger space is just as (if not more) important. The authors suggest that the hiding space may have reduced available floor space for the cats, which in and of itself may be stressful. 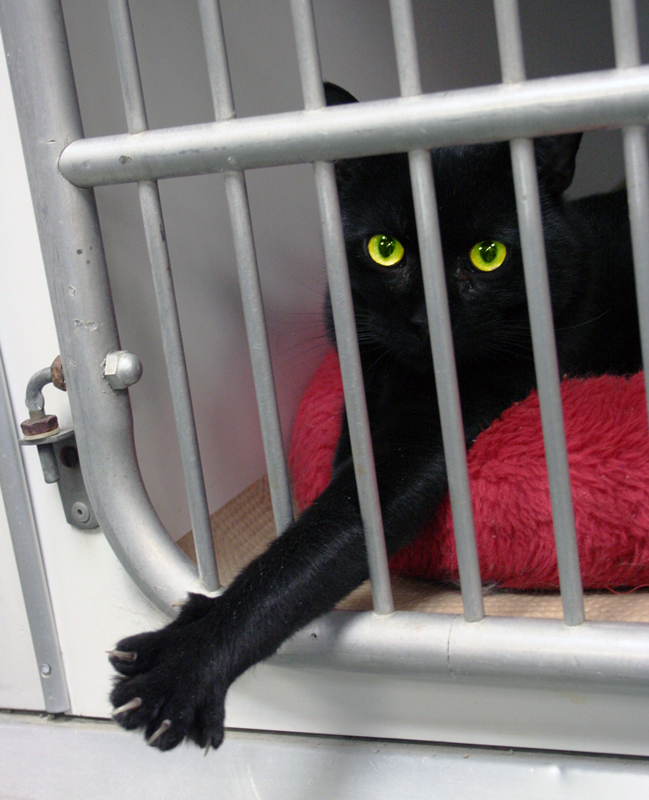 Many shelters are now moving toward the “double cage” model, where the cat’s housing space is two cages connected via a portal. The portal allows for the litter box to be separated from other resources, and also allows shelter care attendants to spot-clean cats’ living spaces while minimizing the stress to the cat (especially for those who are afraid of humans). It also doubles the cat’s space, which we should now be somewhat convinced is a good thing for shelter cats. Given the stress of being in unfamiliar territory, with strange and often scary sounds, smells, and handling, it’s no surprise that cats in shelters are vulnerable. This study adds to our understanding of how to mitigate that threat: by giving them space, and keeping them in place! Shelters should strive to increase housing space for cats, and to minimize the number of times cats are moved around in shelters! Wagner, D. C., Kass, P. H., & Hurley, K. F. (2018). Cage size, movement in and out of housing during daily care, and other environmental and population health risk factors for feline upper respiratory disease in nine North American animal shelters. PloS one, 13(1), e0190140. Posted in cats. Tags: animal shelters, cats, disease protocol, disease transmission, enrichment, hiding, shelter medicine, stress, upper respiratory infections, URI on February 16, 2018 by Mikel Delgado. Scientists have now sequenced the genomes of 54 kitties, including a few wild species. While the emphasis is on learning more about diseases that are common to cats (and in some cases, also in humans), a larger sampling of cats, and hopefully collecting of other data (like BEHAVIOR) will mean a better understanding of what makes cats cats, and how domestication has shaped their bodies, brains, and behavior. Can cats make you take your medicine? We know that cute influences our cognition and increases our focus. Now a company is hoping that it will help you take your pills. Patients with type 2 diabetes will be send medication reminders alongside cute cat photos in the hopes that it will increase adherence to medication regimens. Posted in cats, Friday faves. Tags: 99 Lives Cat Whole Genome Sequencing Initiative, animal shelters, cat aggression, cognition, feline genome, human-cat relationships, kawaii, medical adherence, negotiations, shelter cats, the science of cute on October 9, 2015 by Mikel Delgado. Is there a bias against stray cats? I think most of us who adopt a kitty from a shelter (especially if they are an adult) wonder about their past life, before we brought them home. Who fed them? Were they born under a bed or under a bridge? But how important is it to adopters to know that their cat previously lived in a home, with people? A new study, "Is There a Bias Against Stray Cats in Shelters?" suggests that there might be a bias against stray cats with an unknown history. The authors of the paper, Kathryn Dybdall and Rosemary Strasser, did three studies. In the first, they examined shelter records of adult adoptable cats (12 months or older) who had been listed as either owner-surrender or stray. Owner-surrender cats tended to be adopted on average in 26 days, compared to 32 days for stray cats. Posted in cats. Tags: adoptability, animal shelters, human animal interactions, human-pet relationship, shelter cats, stray cats on December 9, 2014 by Mikel Delgado. I enjoyed this NYT piece on a recent review paper on the possible dangers of laughter, including hernias, dislocated jaws and peeing your pants. Should Santa bring kittens and puppies down the chimney? It's always interesting how we respond to science that goes against our intuition. My instinct is always to tear it apart, but also try to consider the evidence. A recent ASPCA survey found that pets received as gifts were at no greater risk of relinquishment than pets acquired in other ways (they also found that over 20% of all randomly phone people had received a pet as a gift - which just seems high to me!) - what do you think? Dog Spies is on the case, as always bringing us animal-based thoughtfulness. This is more of a book review than anything, but it made me go to the library and check out Behemoth, by Ronald B. Tobias, which details the history of the elephant in the United States. Unfortunately, for most elephants, the story does not end well. Perhaps what is most fascinating is that elephants were often held responsible for "moral transgressions" which sadly led to abuse, corporal punishment and even being sentenced to death. I'm looking forward to reading this book! Posted in Friday faves. Tags: animal shelters, Behemoth, cats, dogs, elephants, human-pet relationship, laughter on December 27, 2013 by Mikel Delgado.